Thinking of a last minute get away? Or a present for Mr-Impossible-To-Buy-For? Well here's a selection of our best late availability deals and recommendations of places to visit. Many of our properties are also offering short breaks for the period, perfect for those of you wishing to escape the festivities. Beach life: Driftwood, Porthtowan. Sleeps up to 4 people right on the sand dunes on the beach, pet friendly with parking. Friday 20th - 27th reduced to £511.20 (saving £127.80). Perfect for long walks on the beach, or cliff tops. Within easy access of Truro for all your supermarket or Boxing Day Deals. Village Life: Fern Bank, Portscatho. Sleeps 6, pet friendly, central village location near to shop, beach and pubs. Friday 20th - 27th reduced to £591.20 (saving £147.80). Wonderful relaxing village, right on the coast, yards from a pint of milk or a pint of something stronger. Perfect escape for you and your dog, with miles of cliffs to walk in both directions. Romantic Retreat: Number One, St Mawes. Sleeps 2, luxurious studio apartment, central village location, within walking distance of many shops and pubs and restaurants. Friday 20th - 27th reduced to £367.20 (saving £91.80). Great location for eating out and exploring coastal life. Wild Escape: Bethel Cottage, Coombe. Sleeps 4, wonderfully romantic spot right on the river for perfect peace and quiet. Yet 10 minutes from the town centre and plenty of facilities. With wood burning stove, pet friendly. Saturday 21st - 28th reduced to £831.20 (207.80). Town life: Imperial Court, Falmouth. Sleeps 4, within walking distance of the town centre. Views over the Port of Falmouth, a few minutes from the wonderful beach at Gyllyngvase. Saturday 21st - 28th reduced to £487.20 (121.80). Rare opportunity to visit this incredibly popular property. 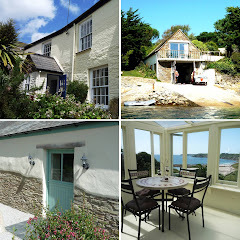 Family life: Pirate Cottage, St Mawes. Sleeps 8 with private annexe, affording you extra space and peace away from the grandchildren. Great views, central location, close to shops, pubs and restaurants. Sunday 22nd - 29th reduced to £871.20 (saving £217.80). For a further properties offering late availability discount visit our Special Offers page on our website. Alternatively email us and we can help you find your perfect property. Our website shows our full range of properties and has live availability so you can be sure if the property is available and what discount you can expect.